When I first set out making these healthy chocolate chip cookie dough bars, I never actually planned on sharing them with you. 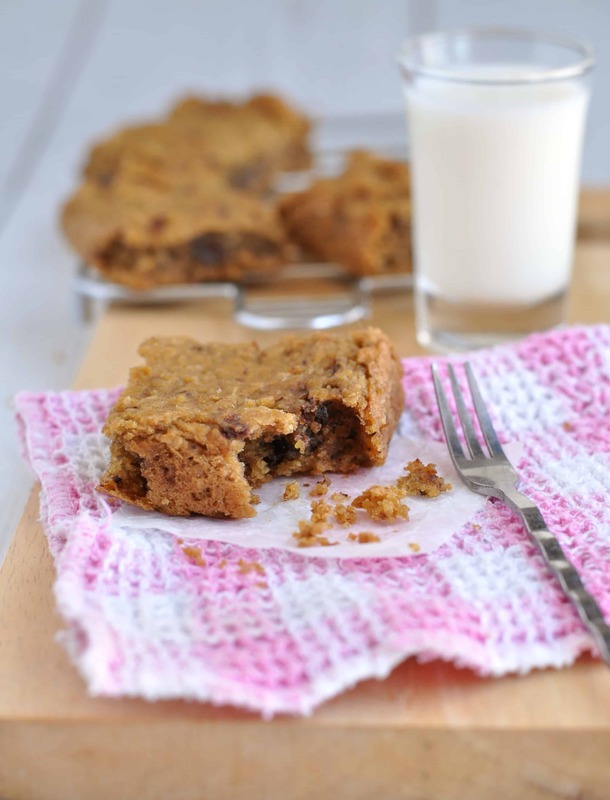 I was inspired by Chocolate Covered Katie’s Healthy Chocolate Chip Blondies and tweaked the recipe, making it a teensy bit healthier and in a smaller batch. Because no matter how healthy your snacks are, if you’re the only one eating them and you’ve got 16 of them sitting on the counter, that’s never a good thing! But as soon as I bit into a fresh-from-the-oven bar, I just knew I absolutely had to share the recipe with you as soon as I could. If you’ve got a bad case of the Monday blues today, this healthy snack recipe is totally going to turn that around. This recipe is another one of those wonderful throw-everything-into-a-food-processor-and-bake ones. (Just like The Best Ever Healthy Banana Bread Muffins!) Aka, my favourite type of recipe. When it comes to some recipes, it’s really important how you add the ingredients and in what order. 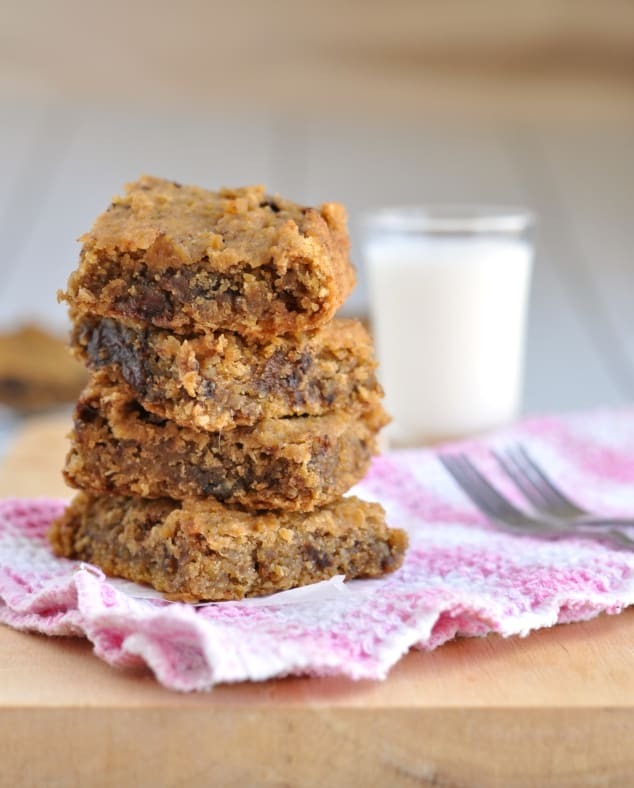 But not when it comes to these healthy chocolate chip cookie dough bars! They were made for the hungry foodie who wants chocolate and they want it now. As well as a food processor, there is 1 more piece of equipment you’ll need if you want this healthy dessert to be easy-peasy to make. I baked my bars in a 6×6″ baking pan. But I don’t actually own a 6×6″ baking pan. So how did I do it? I used my trusty multi-size cake pan. I love this thing so much it’s embarrassing. You can use it to bake anything from 1″ in width up to 12″ in width. And you can even use it to bake up to 2, 3 or 4 evenly sized things at the same time. Seriously – get it in your shopping basket. Or at least on your Christmas list! If you’ve been disappointed by healthy dessert recipes using chickpeas in the past, I beg you to try this one because it will change everything. I make healthy brownies and blondies with chickpeas all the time and I’ve totally mastered the balance of legumes to fats (healthy ones, of course! ), grains and sweetener so you get the most perfect cookie dough texture in the world without any of the nasty chickpea flavour. I mean, chickpeas are great and all, but no-one wants them in their cookie dough! 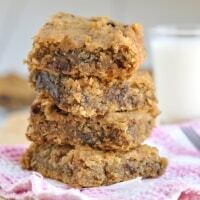 One bite of these healthy chocolate chip cookie dough bars and you'll be in heaven! They've got the most perfect cookie dough texture and they're studded with delicious chocolate chips. But they're totally gluten-free, dairy-free and only 90 calories each! Preheat the oven to 350F/180C and line a 6x6" baking pan with parchment paper. 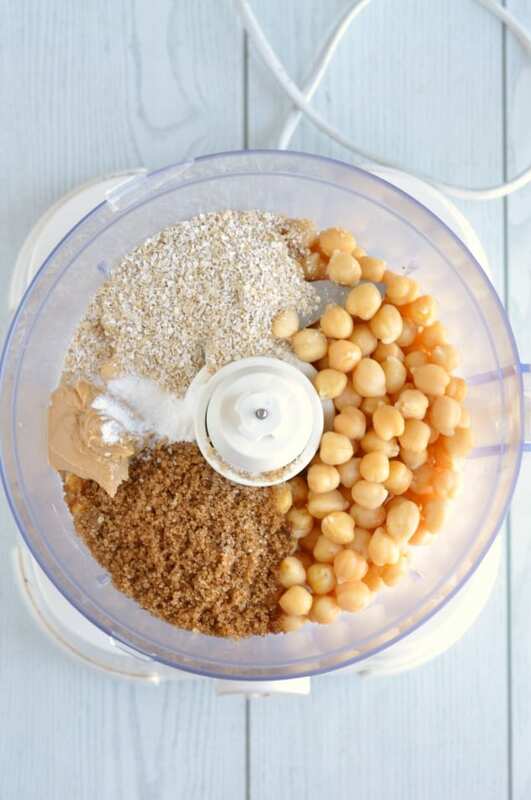 Place all the ingredients (except the chocolate chips) into a food processor and blend for 3 minutes, until you have a smooth batter. You might have to scrape down the insides of the processor a few times to make sure everything is properly mixed up. Stir in the chocolate chips and scoop the batter into the prepared pan. Bake in the oven for 20 minutes, until the edges and the tops are firm to the touch. Leave to cool for 10 minutes in the baking tray before transferring to a wire rack. When totally cool, slice into 9 squares and enjoy! These healthy chocolate chip cookie dough bars will keep inside an air-right container for up to 5 days in the fridge or up to 6 months in the freezer. These look incredible! Just pinned so I’m looking forward to trying them soon! I cannot wait to try these bars. I am so thrilled that the recipe calls for chickpeas and oats. Such a great idea! I will pin them as well! I’ve made treats with chickpeas in the past and they have turned out pretty good…these look delish and I like the addition of peanut butter. I’ll be trying these ASAP! I have started adding chickpeas to my salads, and I have roasted them, but never a dessert. These look delicious. Anything with Health and Chocolate in the title has me all signed up! Thanks for sharing at Monday Funday this week! Healthy and chocolate in one sentence?? Yes! I am in love! OH My Goodness! These look amazing. Thanks for sharing at Tuesdays with a Twist! Looking forward to seeing what you share this week. look delicious. Thanks so much for sharing with Adorned From Above’s Blog Hop 55. We can’t wait to see what you have for us this week. This weeks party is live. Whats Taking place i am new to this, I stumbled upon this I’ve discovered It absolutely useful and it has helped me out loads. I’m hoping to give a contribution & help different customers like its aided me. Good job. Yum…now I am really hungry. Thanks for sharing on the blog hop! Healthy…sign me up. These look amazingly delicious and decadent. Made these last night and they were gone by lunch today! My husband and three kiddos (9, 6, 3) loved them! Oh my goodness, this is Chocolate Heaven! Thanks so much for sharing with Full Plate Thursday and Happy New Year! I usually buy these from the supermarket… but will have my lovely girlfriend try these at home, for sure — thanks!